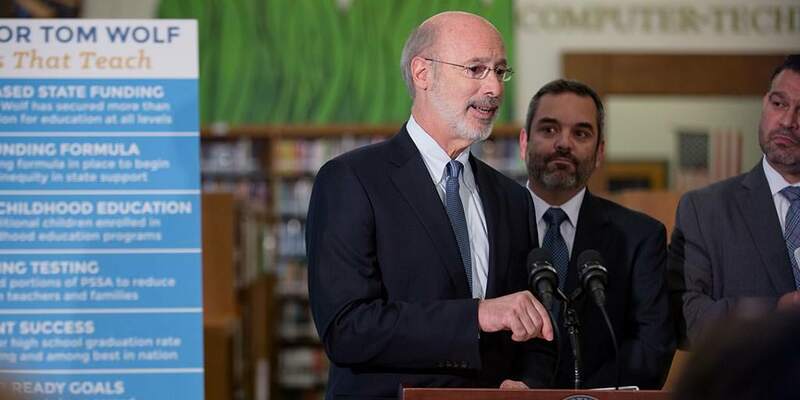 Harrisburg, PA (August 2018)(CNBNewsnet)– Building on the historic investments in schools that have improved education in the commonwealth, Governor Tom Wolf joined Secretary of Education Pedro Rivera, advocates, and educators today to announce a significant reduction in standardized testing. The change to the Pennsylvania System of School Assessment (PSSA) will reduce the length of the tests by 20 percent in grades three through eight. The reduction in test time arose from discussions between the Department and stakeholders for nearly a year as it developed its Every Student Succeeds Act (ESSA) Consolidated State Plan. Beginning this school year, students and teachers in grades 3 through 8 will spend an average of 20 percent less time on statewide testing, and an even greater reduction – nearly 25 percent – for Pennsylvania’s youngest students. The Department has identified and removed two sections – one in math, one in English language arts – and additional questions from the science section, which could eliminate up to two full testing days for some schools. The math assessment will be shortened by 48 minutes for students in grades 3 through 8 by removing a section of multiple choice questions. The English Language Arts assessment will be shortened by 45 minutes and the Science assessment will be shortened by 22 minutes. Additionally, the Wolf Administration worked with internal and external stakeholders to review the proposed changes and ensure the assessments retained their rigor, accuracy, and alignment with Pennsylvania state standards. Standardized tests are mandated under federal law, and can serve as important tools for schools to review their progress and achievement. However, noting that standardized tests not only interrupt learning, but can also be disruptive for students, even those in non-testing grades, the Department plans to continue to identify ways to further reduce those disruptions in coming years. Governor Wolf has fought for Schools That Teach and has made investments in children and schools a top priority. Increased state funding by more than $800 million at all levels after devastating cuts in the past that is bringing teachers back to the classroom and restore educational program. Established a Fair funding formula to reduce the inequity in state support and taking Pennsylvania off a shameful list of states without a way to fairly fund their school. Pennsylvania was one of only three states in the nation without a fair funding formula. Doubled early childhood education access to provide nearly 8,800 more children access to Pre-K and Head Start programs to get a good start to their education. Increased graduation rates to among the highest in the nation for four-year high school from 85.5 percent in 2013-14 to 86.1 percent in 2015-16. Additionally, 31 percent more students have earned industry-recognized credentials as Pennsylvania has become a national leader in STEM education, helping workers compete in the 21st century economy and build economic prosperity for working families. Also this year, the Department introduced the Future Ready PA Index, a new, public-facing school report card that expands the indicators used to measure performance, extends the comprehensive approach to ensuring student and school success. The Index will place additional emphasis on academic growth, evaluation of school climate through a robust chronic absenteeism measure, attention to both four-year and extended-year graduation rates, and assessments of postsecondary readiness. Details about the PSSA reduction and the Future Ready PA Index are available in Pennsylvania’s ESSA Consolidated State Plan, on PDE’s website. The plan is open for public comment until August 31, 2017.